Jesus Christ, a very revered and worshipped deity and fore-founder of Christianity, is known for his miracles and wise messages from God. He has since time been a popular subject in art and literature. 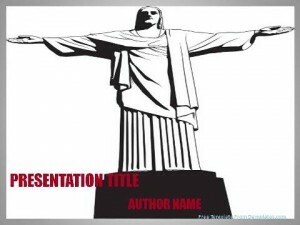 This Portrayal Of Jesus PowerPoint Template has a looming black and white portrait of Christ, as seen in the ‘Christ the Redeemer’ statue in Brazil, with widespread arms as if to say that he is watching over and protecting all devotees of God. 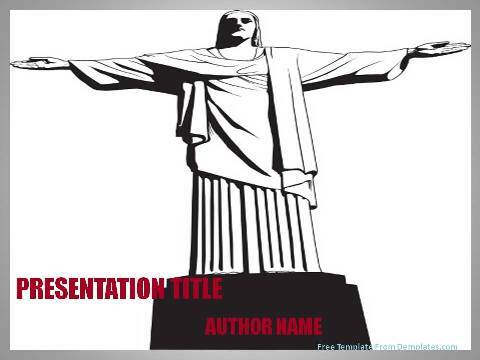 This free PowerPoint template can be used by tourist guides and tourism websites while offering religious tour packages, with text about the statue. 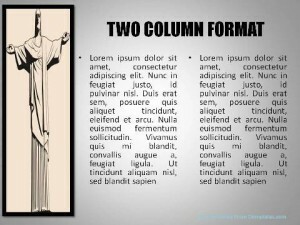 The presentation can also contain paintings like ‘The Last Supper’ and literature about Christ being of dual nature- human and divine while presenting in seminars in schools and colleges about arts and humanities related subjects. This PowerPoint template can be used in church websites with life account of Jesus, with accompanying pictures and important verses.